I purchased Silver Wampum in 1978 when he was just six months old. 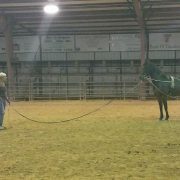 He was the horse I had always dreamed of having, an Arabian. Initially he was to be my trail horse so that is what we did for the next six years. We rode the trails all across Southern California. Then in 1986 I was in an auto accident that pretty much put an end to my riding. This is when I decided to teach Silver Wampum how to drive. 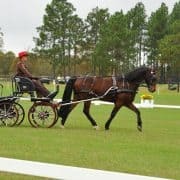 I was lucky enough to live close to the late Anita Mellot and her beautiful Friesians and was able to go to her to learn about driving. Silver Wampum was the start of my driving career. He turned out to be a natural at driving and I showed him for the first time at the San Diego Open Driving Show in 1990 where we took a 1st, 5th and 4th in our driving classes. 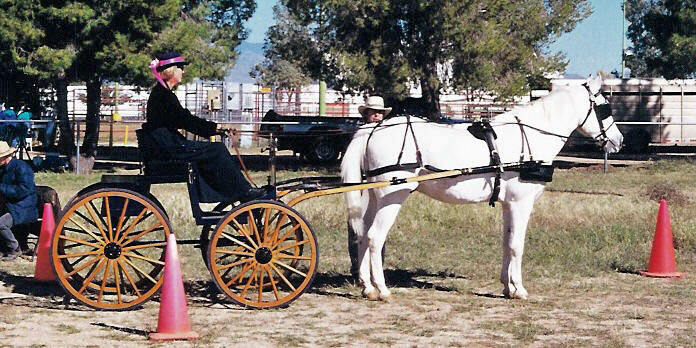 Our first official ADT (Arena Driving Trail) was the Old Pueblo in Tucson, AZ in 1995 where we placed 2nd. 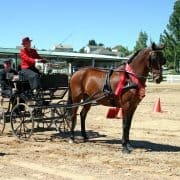 Aside from competing in CDE events in both California and Arizona he has shown in many shows both in San Diego and Phoenix, where he was high point winner in his division two years in a row at the Arizona Driving Festival. He has participated in many parades over the years as well as carrying many brides to their weddings. Silver Wampum had a role in a TV commercial for an upscale ladies boutique in Palm Springs and has served as a model for the Petsmart store in Palm Desert, and is the only horse that was named pet of the month by Petsmart. 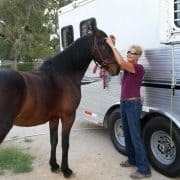 Aside from driving he is an accomplished trail horse and has taken me to places like Havasupi in the Grand Canyon, Willie Boy Ride, Phoenix to Wickenburg Ride, Palm Springs to Joshua Tree and Man Against Horse Race. He has also served as my mount for four years while on the Riverside County Sheriff’s Posse search and rescue. 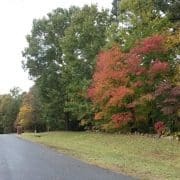 We did many more competitions, fun drives and yes some trails rides over the next five years. 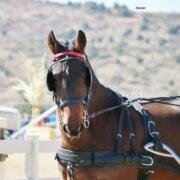 Silver Wampum did his last CDE (Combined Driving Event) at the age of 20 and earned the Best Arabian award. At the age of 22 Wampum left the world knowing that he was loved and cherished. Silver Wampum will always be remembered for his ability to adjust to any situation.